The final edition of Wavelength's summer music festival wrapped up with giant parachutes and confetti cannons courtesy of Rich Aucoin. Rich Aucoin is super happy to be there, as are his fans. Catl. is much louder than you'd expect a two-person band to be. Rich Aucoin is a man of the people. There was also table tennis. Campers at the ALL CAPS! music festival. Photo by Corbin Smith. Local music lovers celebrated the end of an era over the weekend as the fifth and final edition of Wavelength’s ALL CAPS! Island Festival took place at Artscape Gibraltar Point on Toronto Island. The festival featured 12 bands over two days, as well as art exhibitions, a giant game of Jenga, a late-night dance party on Saturday, and endless trips to the beach. Roughly 300 people attended, more than half of whom camped out on the island on Saturday night. 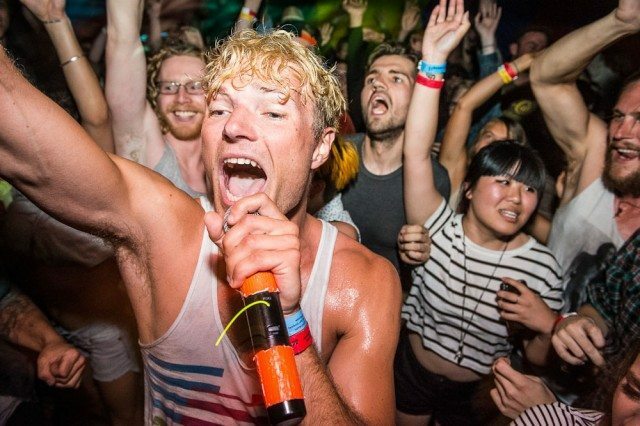 The bands were primarily local, although Saturday was headlined by Brooklyn-based electronic weirdos The Blow, while Sunday’s main attraction was a high-energy set from Halifax’s Rich Aucoin. ALL CAPS! and Wavelength programmer Ryan McLaren said he felt the festival had run its course, and that both he and Wavelength were ready to move on to new things. He said that when he started the festival, the goal was to provide Torontonian music lovers with something different. He certainly succeeded this weekend. Festivalgoers were treated to the raucous, rockabilly howl of Catl. and the airy, post-R&B of Bizzarh. Rich Aucoin, who closed the weekend, was received with particular enthusiasm. The crowd managed to match his almost-manic energy, which wasn’t easy, considering the fact he played part of his set in the middle of the crowd, under a giant parachute, and kept hitting the audience with confetti cannons. Valentine said her band was thrilled to be part of the final ALL CAPS!. She added that while playing Wavelength shows was a crucial part of the group’s development, Magenta Lane had never managed to play, or go to, ALL CAPS! before. Wavelength co-founder Jonny Dovercourt said that he and the rest of the Wavelength braintrust were particularly careful in selecting bands for the final festival. Some acts, like Catl. and The Blow, were repeats from pervious years, and others were newcomers. Plus, there were some environmental factors to consider. He adds that while this is the final ALL CAPS!, he’s not ruling out having Wavelength do something else on the island in future. Link Website:Cheap Nike Air Max Cheap Jordans Cheap Snapbacks Hats Calzoncillos Calvin Klein Louis Vuitton Outlet Store Camisetas De Futbol Baratas All shops Free Shipping! Welcome!